Voting is now open for all award categories. Go to http://www.americangrouptravelawards.com to vote. The American Group Travel Awards (AGTA) is recognizing excellence in group travel by announcing the nominees for the 2014 awards. Each nominee has been selected by a panel of industry experts as providing the highest quality group travel service, product and overall experience. Effective August 1, 2014 voting is now open to recognize the Best of the Best in each category. To vote please visit http://www.americangrouptravelawards.com. The voting link is clearly marked and located on the home page. This year there are 22 categories of excellence in group travel that recognize airlines, hotels, cruise lines, destinations and more that provide superior group travel experiences. On November 11, 2014 the stars of group travel will gather at the Hudson Theatre in the Millennium Broadway Hotel where the winners of each category will be announced. The host for the evenings festivities, Dylan Ratigan, is a former MSNBC television host and documentary film producer. Peter Stonham, Landor Travel Publications, said, “From our vantage point in the UK we find that the growth of group travel is a worldwide phenomenon. More companies, organizations and leisure travelers want to travel together to have shared experiences. We’re pleased to partner with HotelPlanner to recognize the best group focused organizations in the United States”. 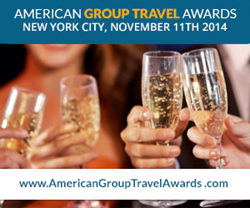 The nominees for the 2014 American Group Travel Awards are…. HotelPlanner and Landor Travel Publications congratulate this year’s nominees! About HotelPlanner: HotelPlanner.com provides online services to the global group hotel market. The company’s service ensures the lowest rates by allowing customers to receive quotes online directly from hotel group sales managers. The company also provides mobile applications for booking group hotel reservations and owns and operates Meetings.com, a site that provides information and booking services for meeting and banquet venues around the world for corporate and association meeting planners. HotelPlanner allows customers to book hotels for business meetings, conferences, conventions, family reunions, weddings, extended stays, tours, military reunions, church events, and group travels. HotelPlanner.com was founded in 2002 and Meetings.com was acquired in 2010. The company’s USA headquarters is based in West Palm Beach, Florida. The company opened its European headquarters in London, United Kingdom in 2012 and its Las Vegas western regional office in January 2014. The company plans to open an office in Hong Kong in the fourth quarter of 2014. About Landor Travel Publications: Landor Travel Publications is the publisher of Group Travel Organiser magazine, the UK’s first and leading publication exclusively addressing the needs of group travel organisers. GTO was first published in 1988 and over the past 19 years has brought a wealth of news, information and ideas for group trips to organisers all over Great Britain. The magazine is published ten times a year and mailed to 10,000 individuals, along with numerous supplements on particular countries, regions and subjects of interest to groups.